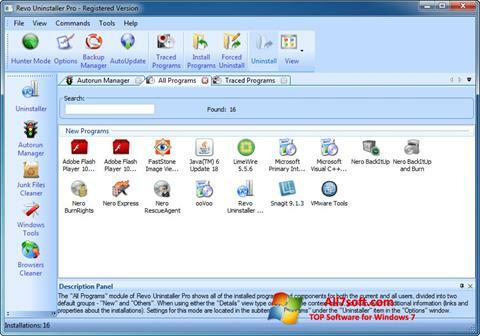 Revo Uninstaller Pro for Windows 7 - a multifunctional complex designed to work with installed programs. With it, you can quickly make a list of installed applications, analyze the installation path and completely remove them. The utility is able to change the registry, removing traces of remote programs. For the safety of users, the application has several modes of operation, each of which limits or expands the functionality. Thanks to the system recovery feature, users can remove undesirable consequences of the utility, rolling the system back before the changes begin. You can free download Revo Uninstaller Pro official latest version for Windows 7 in English. Publisher Software: Vs Revo Group Ltd.